SPRING SALE! THROUGH APRIL, ALL DAVE WILSON FRUIT TREES & BERRIES ARE 20% OFF! Spring is the perfect time for planting! In the Bay Area, winter is an excellent opportunity to start or add to your home orchard. This year we are proud to offer trees from Dave Wilson Nursery. Pollinate also offers blackberries, blueberries, boysenberries, currants, grapes, olallieberries, raspberries, and asparagus and strawberry crowns for winter planting. Quantities are limited, so call to reserve. Pollinate Farm & Garden hosts a series of orchard care workshops throughout the year. Check our website for the schedule. 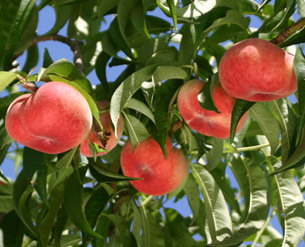 We’re committed to your backyard fruit tree success! Remarkable fruit for mild winter climates in So. Calif., So. Ariz. Heavy crops of sweet, crisp, flavorful apples even in low desert. Fresh/cooked. Keeps 2 months in refrigerator. 200 hours. Self-fruitful or pollenized by Dorsett Golden or Einshemer. USDA Zones 5-10. New, from New Zealand. Superb late season fruit: very crisp and tangy, more flavorful than Granny Smith. Excellent keeper. Green with dark red blush. October-November harvest. 700 hours. Self-fruitful. USDA Zones 5-10.
reddish orange skin, sometimes russeted. Ripe mid-September. Excellent pollenizer for other apple varieties. Low chilling requirement - less than 500 hours. Self-fruitful. USDA Zones 6-9. Wonderful dessert apple from New Zealand. Crisp, nice blend of sweetness and tartness, rich flavor. Skin reddish orange over yellow. Early harvest, 2 - 3 weeks before Red Delicious. Good pollenizer for other varieties. Adapted to cold- and warm-winter climates. Chilling requirement less than 500 hours. Self-fruitful. USDA Zones 4-10. From New Zealand. Large, late, green, all-purpose. Crisp, tart, excellent keeper. Requires long summer. Thrives in hot climates. 400 hours. Prolonged bloom: good pollenizer for other apples. Self-fruitful. USDA Zones 6-9. Winter hardy tree from the University of Minnesota. Fruit is crisp and juicy with an aromatic flavor. Striped red over yellow color. Stores well. Ripens mid-August. Pollenized by Gala, Granny Smith, Empire, McIntosh and Red Delicious. USDA Zones 3-8. Anna, Dorsett Golden and Fuji budded onto M-111 rootstock. Hot climate apple from Western Australia. Very crisp, sweet tart, distinct flavor, good keeper. Skin reddish pink over green when ripe. White flesh resists browning. Harvest begins late October in Central CA, about three weeks after Fuji. Self-fruitful. 300-400 hours. USDA Zones 6-9. All-purpose freestone. Sweet, aromatic, flavorful - the long-time No. 1 apricot in California. Early bloom. Late June harvest in Central CA. 400 hours or less. Self-fruitful. USDA Zones 7-8. Tomcot, Katy, Blenheim, Flavor Delight Aprium® and Royal Rosa budded onto Citation rootstock. Finished trees include 5n1's plus assorted 4n1's and 3in1's. Popular, large yellow freestone. Early harvest fruit is firm ripe and tangy, later harvest is sweet with rich flavor: high scoring in taste tests. Late July/early August in Central CA. 500 hours or less. Self-fruitful. Long-time favorite white-fleshed freestone. Sweet and juicy, aromatic, low in acid. High scoring in taste tests. Ripens mid-July in Central CA. Widely adapted (low chill requirement, yet not early blooming). 250-300 hours. Self-fruitful. Unique white-fleshed fruit with a sunken center (shaped like a doughnut). Sweet, with a mild flavor described by some as almond-like. Ripens late June/early July in Central CA. Estimated chilling requirement 200-300 hours. Self-fruitful. Sweet, flavorful plum, more widely adapted than Santa Rosa (more productive in cool, rainy climates). Red over yellow skin, amber flesh streaked red. Ripens June in Central CA, a week or more before Santa Rosa. 250 hours. Self-fruitful. Home orchard favorite: large, heart-shaped fruit with sweet, juicy, richly flavored, firm red flesh. Dark reddish-purple mottled skin. Long harvest season - September in Central CA. Hardy, heavy bearing tree. 500 hours or less. Pollenize with Beauty or Santa Rosa. Most popular plum in California & Arizona. Juicy, tangy and flavorful. Reddish purple skin, amber flesh tinged red. Late June in Central CA. 300 hours. Self-fruitful. One of the most flavorful, aromatic Japanese plums when fully ripe. Beautiful 8-10 ft. tree, weeping growth habit: long slender limbs bow gracefully to the ground. Easily espaliered. 200-400 hours. Self-fruitful. (Morus nigra sp.) Large, shiny fruit similar to Persian, known for its flavor. Can be grown as a tree or large shrub. Ripens early summer. Attractive to birds. Self-fruitful. 200 hours or less. USDA Zones 7-10. The industry standard. Purplish-black skin, strawberry-colored flesh, rich flavor. Heavy bearing, long-lived, large tree. Coast or inland. Two crops per year. Fresh/dry/can. 100 hours. Self-fruitful. USDA Zones 7-9. Large, light greenish-yellow 'white' skin, amber flesh. Long-lived, vigorous. Prune to any shape. Very sweet fruit needs hot weather to ripen. Fresh/dry/can. 100 hours. Self-fruitful. USDA Zones 7-9. Small to medium size purple-black fruit with a very deep red strawberry pulp and distinctive, sweet, rich flavor. Brebas are pear-shaped with a thick, tapering neck, main crop figs are variable, often without neck. Medium eye. Excellent fresh or dried. Good for container culture or small spaces. Hardy. Self-fruitful. USDA Zones 5-10. Medium size, flat shape, still crunchy when ripe, non-astringent. Cool or hot climate. Hardy, attractive tree, practically pest free. Fall harvest. 200 hours. Self-fruitful. Large, deep orange-red, acorn-shaped. Hot summer required to mature the fruit. Sweet, flavorful, astringent until soft ripe. Mature fruit can be frozen and thawed to ripen. Productive, ornamental tree. 200 hours. Self-fruitful. Very sweet, virtually seedless fruit. (Even immature fruits are sweet.) Red skin, clear (non-staining) juice. Harvest late summer through fall. Coast or inland. 8-10 ft. arching shrub, or train as tree or espalier. Large, showy, orange-red flowers. 150 hours. Self fruitful. Large size red fruit is sweet with a hint of acidity. Arils are red with very small edible seeds. Vigorous upright plant sets a heavy crop dependably. Maintain at any height with summer pruning. Consistently receives the highest praise for overall flavor. Great for juice or fresh eating. A Dr. Gregory Levin introduction through U.C. Davis. Very highly rated in U.C.Davis taste tests. Some rate Parfianka as the best tasting pomegranate. Required chill hours 100-200. Self-fruitful, best in zones 7-10. Southern Highbush. Midseason, sweet, firm berry. Upright and quite compact bush, with fruit borne on the outer periphery. Chilling requirement is estimated at 400-500 hours. Southern Highbush. Large fruit is especially sweet and flavorful. Early season. 5-6 ft. bush. 200 hours. Self-fruitful, but plant two varieties for largest crops. Rubus ursinus var. loganobaccus, a hybrid of blackberry, raspberry, dewberry and loganberry. Very large berry up to 2.5", dark maroon in color with an intense, tangy, sweet flavor. Excellent quality with few seeds and a pleasant aroma. Vine-like trailing growth habit. Harvest through summer. Self-fruitful, best in zones 5-10. Bright red fruit used either fresh or dried. Contains the highest antioxidant level of any fruit type. Drought tolerant once established and very cold hardy. Self-fertile. USDA zone 5-9. Late season red wine grape with small, black, strongly flavored berry. Vigorous, upright vine. 100 hours. Self-fruitful. Cane prune. Versatile, long-time favorite American grape. Blue-black berry with rich, distinctive flavor, used for table, juice, jelly and wine. 100 hours. Self-fruitful. Cane prune. Medium-sized, light red. Crisp, sweet, excellent flavor. For fresh use or raisins. Needs hot summer. Ripens before Thompson. Vigorous. 100 hours. Self-fruitful. Cane or spur prune. Most popular grape in CA, AZ. Fresh and raisins. Pale green, very sweet. Thin the clusters for larger berries. Needs plenty of heat. 100 hours. Self-fruitful. Cane prune. Morus sp. 'Dwarf Everbearing' This bush form of mulberry continuously produces sweet blackberry-like fruit throughout the season. A great choice for container gardening, minor pruning will keep the plant compact. Mature height 6'-8' if grown in the ground. Widely adapted, self-fruitful. USDA zones 5-11. More tolerant of wet soils than Nemaguard. Also more cold hardy. Susceptible to nematodes in sandy soils. For plums, peaches, nectarines, apricots, prunes, almonds. Vigorous, resists root-knot nematode. Excellent for well-drained soils. In poorly-drained soil, plant on a hill. For nectarines, apricots, plums, prunes, almonds. Shallow but vigorous root system. Tolerates wet soils. Immune to root-knot nematodes, some resistance to oak-root fungus. Trees reach larger size compared to Marianna 26-24. For apricots, plums and prunes. The most common persimmon rootstock and is compatible with most commercial cultivars. It tolerates a wide range of soils, produces uniform seedlings, grows vigorously, resists drought, and produces a fibrous root system that transplants easily. D. lotus is tolerant to Armillaria, but susceptible to crown gall and Verticillium and does not tolerate poorly drained soils.